"7" seems to be Toyota's unlucky number. 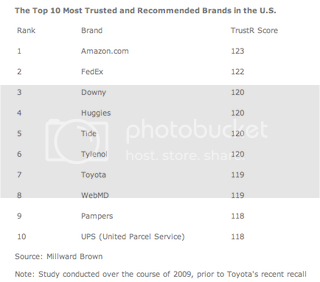 The auto giant landed the 7th spot in two rankings last year: Millward Brown's Most Trusted U.S. Brands as well as Sponsorship Spending Among U.S. Companies, shelling out as much as $175 Million in '09. At least one of those studies will surely change in '10. As Toyota looks to repair its image, what role will sponsorship play in rebuilding trust among disenfranchised consumers? How will the assets and activations they've previously employed be altered to meet the short term crisis management strategy and the long term needs of the brand? Toyota, which spends 90% of its sponsorship budget on sports, including numerous NASCAR deals and its NBA naming rights sponsorship in Houston, last week signed an agreement worth roughly $700K to sponsor the parking garage at the Memphis Grizzlies' home, FedExForum.